Could Tracking Tannin Triple Ontario Wine Sales? 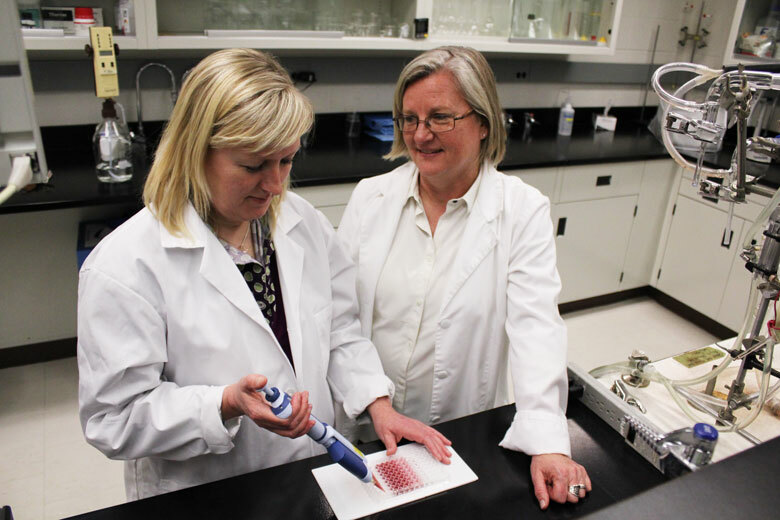 Belinda Kemp and Debbie Inglis prepare samples for a database of tannin levels obtained from Ontario grapes at Brock University's Cool Climate Oenology and Viticulture Institute. St. Catharines, Ontario, Canada—Ontario’s wine industry hopes that better tannin management will help triple sales of the province’s red wines by 2026. Backed by more than $350,000 CAD (or about $270,000 U.S.) in government and industry funding, Belinda Kemp and researchers at Brock University’s Cool Climate Oenology and Viticulture Institute (CCOVI) are preparing a database of tannin levels in Ontario grapes that will underpin TanninAlert, a service scheduled to launch in 2018. The database will help grapegrowers and winemakers better understand the development and accumulation of tannin in local grapes—and support the development of recommendations to guide winemaking practices to optimize tannin extraction and ensure balanced wines. Guidance from the Liquor Control Board of Ontario (LCBO), the province’s government-owned liquor vendor and the world’s single-largest wine buyer, is encouraging the province’s wineries to produce wines that reflect consumer demand. “They’re saying what they need or are looking for red wines are ripe, rich, rounded red wines, and our industry’s interpretation of that really speaks to tannin balance in our red wines,” explained Debbie Inglis, director of CCOVI. Right now, grapegrowers and winemakers have little understanding of tannin development and concentration, and few have the equipment to measure tannin levels. The database will collect information that will give the industry a better grasp of what’s happening in the grapes. Tannin measurements will complement information already provided to the industry through Brock’s pre-harvest monitoring program, which measures elements such as Brix, pH and acetic acid. CCOVI will provide tannin information and associated recommendations on a subscription basis when the service launches in 2018. Allan Schmidt, president of Vineland Estates Winery and chair of the Wine Council of Ontario serves as a director of Ontario Grape and Wine Research Inc., which allocated industry’s portion of the project’s funding. Schmidt said the result will be wines that are of higher quality, more appealing to the consumer and, in turn, more likely to sell and garner revenues for producers. The payoff could be significant. Ontario shoppers bought $695 million CAD ($536.5 million U.S.) worth of red wine last year, with Ontario wines (those made entirely from local grapes, as well as those blended with juice from elsewhere) accounted for 22% of sales. CCOVI hopes that TanninAlert will help the industry nearly double its market share to 43% of red wine sales by 2026, when the LCBO expects shoppers to be knocking back $1.1 billion CAD ($848.9 million U.S.) worth of red wine. That would see sales of Ontario red wines hit $473 million CAD ($365.1 million) from $152.9 million CAD ($118 million) today, supporting an estimated 800 jobs. All going well, the service won’t just benefit Ontario producers. “CCOVI’s program would develop the actual database where all the information is going to be stored, so the idea is, down the road, we’re all going to be using the same methods for tannin extraction and evaluation, and then we’re going to open up this database across Canada,” Inglis said. The wide range of growing conditions and grape varieties across the country mean local research partners will be critical to delivering accurate and reliable guidance to winemakers, but having a single protocol for collecting the information and a database housing it promises to boost the industry’s understanding of itself beyond specific regions. However, winemaking is ultimately a local exercise that expresses the character of local fruit grown under specific conditions. I doubt if Ontario will have much flexibility to delay harvests for tannin development on a consistent basis. Niagara often gets high levels of rain and humidity around harvest time that rapidly leads to disease pressure and prompts immediate harvest (even if the grapes aren't at “optimal" ripeness for sugars and tannins). Waiting for optimal tannins to develop at the expense of losing tonnage to rot or dealing with more rot at the winery does not seem realistic for Niagara. Here in BC this might be more useful, but we already have issues of sugars and alcohol outpacing tannins that prompt harvest before “optimal” tannins evolve. I’m doubtful this tannin work will really have any real impact as a result. Growers are paid for sugars and tonnage, not tannins. will this work help the GGO get me better prices for my grapes? Let get real. Increasing sales of red Ontario wine demands a drop in LCBO retail mark up (not the taxes) which is far too high and neglects the world competition winemakers are facing. Certainly a better appreciation of tannin profiling by variety is an important factor in cold climate viticulture. This might also highlight the potential advantages in co-varietal fermentation. My limited experience with approximately 30 different red hybrids shows them all as tannin deficient if compared to current popular vinifera varieties. However this is not all bad when considering styles of lighter reds and rosé.